Kizhi Island in winter time is the place of rare beauty! 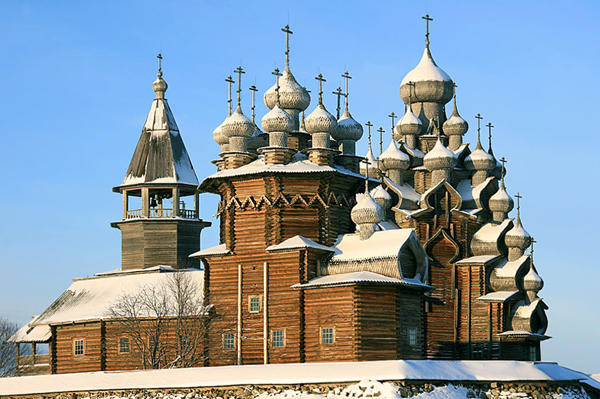 Dark silhouettes of the famous wooden churches of Kizhi on a crispy blanket of white snow look absolutely stunning. It will take you only a bit more than an hour to cross the second largest lake in Europe, Lake Onego, and reach Kizhi by hovercraft from Petrozavodsk. 10:00 Departure by hovercraft to Kizhi Island (about 1h 20 min). 11:30 Upon arrival you will get acquainted with the central exhibition of the Kizhi State Open-Air Museum with the world-known wooden Kizhi churches. Even if you have already seen Kizhi in summer, a completely new world will open in front of you in winter time: crispy colors, peace, tranquility of winter landscapes and dark silhouettes of the churches create the scenery of rare beauty. If you are lucky to witness the play of light of the setting sun over the silverish domes of the church of the Transfiguration, that will be the moment you will hardly ever forget. 12:50 After the excursion you will drink a cup of hot herb tea with national pastry and then a bus will take you to the other side of Kizhi Island, where you will get acquainted with the restoration centre of the main church of the Kizhi Ensemble. You will see where and how the church is being restored and learn some secrets of traditional Russian wooden architecture.